Tonight felt like a flashback to a simpler time. Granted, Andrew Bogut last played with the Warriors in just 2016, but Bogut’s time with the Warriors feels much further removed than the fewer than three years it’s been. With DeMarcus Cousins out, tonight marked the perfect opportunity for Andrew Bogut to make his Warriors part two debut. Bogut has been playing in the Australian National Basketball League for the Sydney Kings with a tremendous stat line on a thinned out frame. In 30 games for the Kings which earned him MVP of the league, Bogut averaged 11.4 points (56 percent shooting), 11.6 rebounds, 3.4 assists, and 2.7 blocks per game on 29.7 minutes per game. I use the above lyric ironically, because every single person who stepped on the court tonight for both the Warriors and Spurs scored a point. In fact, 16 of the 19 players who played tonight scored at least five points, and everyone but Jordan Bell scored at least three. It was indicative of a game that was defined by good bench play on either side. Rudy Gay, Patty Mills, Marco Belinelli and Davis Bertans combined for 41 points off the bench, and while Bertans and Bellineli only had 5 and 9 points, respectively, they scored huge buckets. 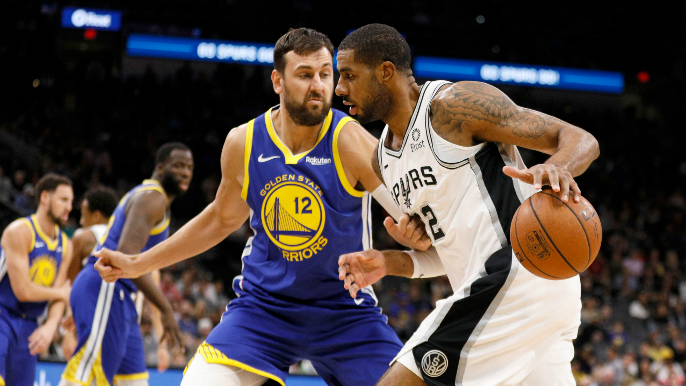 Belinelli had a four-point play in the fourth, and Bertans scored the final three of the game, which put it out of reach for the Warriors (despite multiple chances at the end to keep the game in touch). While the Warriors’ bench wasn’t spectacular, Alfonzo McKinnie notched 8 points and 6 rebounds (2 offensive), and Kevon Looney added 6 points, 3 rebounds (2 offensive), 2 assists and 1 steal. But it wasn’t the Warriors’ bench that was the issue, it was the woeful shooting of Stephen Curry and Klay Thompson. Curry and a stretch of 8-straight points on 3-straight possessions, but then couldn’t keep the consistency. Thompson had a similarly positive stretch late in the game, but not during the final minutes. As a whole, it manifested in poor shooting performances from two of the greatest shooters in NBA history.